Jungle Kartz is an exhilarating arcade racing game where all the action takes place on a tropical island. With eight challenging environments covering 32 monster tracks including Tropic Bay, Rift River Valley, Ra Desert and more, it’s a frantic race to the finish line. Take to the road and race as eight fun-loving animal characters, each with a unique special track advantage, including Sass the Tigress, Gus the Gorilla, Rocky the Coyote and many more. 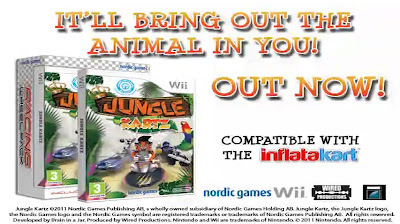 Available to buy now exclusively for Wii!